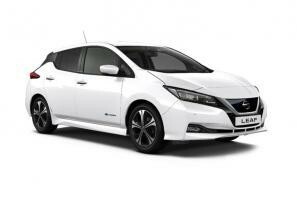 Find the best Nissan Leaf leasing deals at CarLeasing.co.uk. The all new Nissan Leaf is a small to medium sized family hatchback. Being one of the first all electric cars to undergo WLTP testing, the Nissan Leaf proved it's prowess with an impressive range of 168 miles on a fully charged 40kWh battery, making it a sensible and trustworthy vehicle to keep you and your passengers on the road. Our latest Nissan Leaf leasing deals. Click the links below to view our latest Nissan Leaf leasing options. 3 reasons to lease your next Nissan Leaf from us. We deliver your brand new Nissan Leaf vehicle for no additional cost.